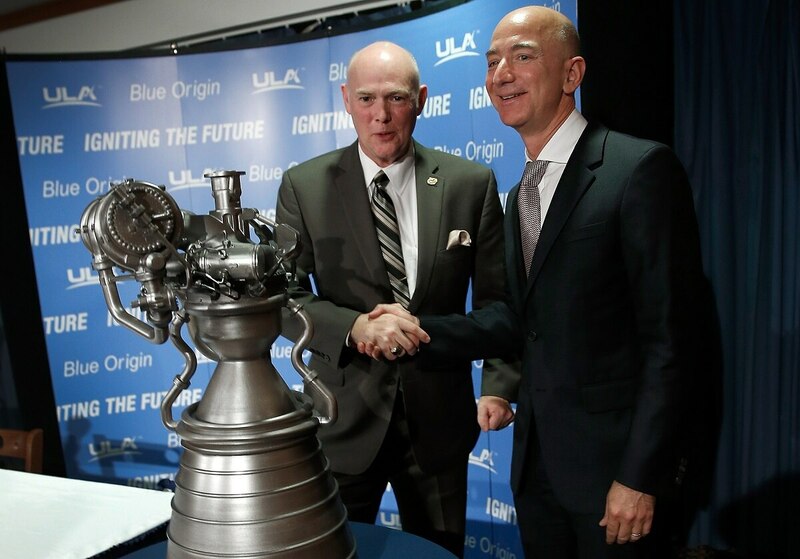 WASHINGTON — The United Launch Alliance has selected Blue Origin to provide the engine for its Vulcan Centaur boost-phase launch vehicle, a big win for the Jeff Bezos-founded company. The selection comes four years and 10 days after a Sept. 17, 2014, news conference in Washington where Bezos and Bruno unveiled the BE-4. The selection of the engine is a major point in Vulcan’s somewhat dramatic history. United Launch Alliance CEO Tory Bruno isn't hinting about when the company could decide between engines by Blue Origin and Aerojet Rocketdyne. For years, ULA had a monopoly on military space launch capabilities, with the company’s Atlas V launch vehicle relying on Russian made RD-180 engines to get to orbit. That agreement worked until allegations came to light of Russia invading Ukraine in 2014, setting off a wave of questions on Capitol Hill as to why the U.S. was relying on Russian technology to get key military systems into space — and lining the pockets of Russian elites with close ties to President Vladimir Putin in the process. The ensuing fight, spurred in part by ULA’s rival SpaceX, ended with Congress banning long-term use of the Russian engines and with ULA deciding to design a new launch vehicle — the Vulcan, unveiled in April 2015. Aerojet Rocketdyne — which in 2015 considered a bid to buy ULA outright for a reported $2 billion, before being rejected by Boeing and Lockheed — isn’t locked out entirely on the program, however, as the company’s RL10 engine had been previously selected for the Centaur’s upper stage. ULA says Vulcan is expected to be ready for its first flight in mid-2020. Other component manufacturers include Northrop Grumman, L‑3 Avionics Systems and RUAG.